Topps Attax = MLB Showdown? In my opinion, trading card games dealing with sports never really impressed me. I’ll admitt that when MLB Showdown came out in 2000 I gave it a shot, but I lost interest in it pretty quick. The only MLB Showdown cards I have now are the few Phillies I was lucky to pull. With the newly released Topps Attax Card Game, I have a feeling that it too will suffer the same fate as MLB Showdown. Maybe its just me, but I don’t see kids sitting and playing card games in today’s society. As for dollar value concerning sports related trading card games, there really isn’t much. I have only found two MLB Showdown cards actually worth something. 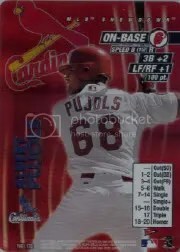 One would be the 2001 MLB Showdown Albert Pujols Pennant Run #168 RC valued at $40.00 to $50.00. The other would be an Alex Rodriguez MLB Showdown promotional card that was inserted into Beckett Baseball and can be found for about $15.00. I think the absence of rookie cards within Topps Attax will hurt. At least with MLB Showdown they included a few rookies which helped it become more of a collectible versus a game.